A hypothetical exoplanet is depicted here moving through its star's habitable zone and then further out into a long, cold winter. Life may be able to survive on a broader set of alien worlds than astronomers had thought, a new study suggests. Researchers have created a new online tool called the "Habitable Zone Gallery," which looks at every known exoplanetary system and determines that just-right range of distances from the host star where liquid water could exist. 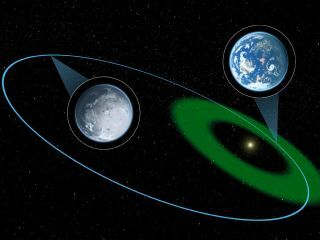 The upshot is that scientists might not need to pin their hopes for alien life on a planet like Earth, whose circular orbit keeps it in the middle of the habitable zone all the time. Large numbers of alien planets on eccentric, highly elliptical orbits likely dip into the habitable zone now and again, bringing them brief periods of benign conditions, scientists said. And research here on Earth shows that life can survive big swings between hot and cold, wet and dry. "We know that others can withstand very extreme heat conditions if they have a protective layer of rock or water," Kane added. "There have even been studies performed on Earth-based spores, bacteria and lichens, which show they can survive in both harsh environments on Earth and the extreme conditions of space." Even planets that might be hostile to large organisms could conceivably host smaller, simpler life-forms, researchers said. After all, humans could not have survived on Earth back in the early days, when life first got a foothold on our planet. "Life evolved on Earth at a very early stage in the planet's development, under conditions much harsher than they are today," Kane said. Many life-harboring worlds might potentially not be planets, he added, but rather moons of gas giant planets like Jupiter or Saturn in our own solar system. "There are lots of giant planets out there, and all of them may have moons, if they are like the giant planets in the solar system," Kane said. "A moon of a planet that is in or spends time in a habitable zone can be habitable itself." Kane cautioned that it's tough to know anything definitive about the habitability of a planet or moon without detailed knowledge of its atmosphere. Both Earth and Venus experience greenhouse effects, for example, but Venus' has gone into runaway mode, making its surface hot enough to melt lead. Still, the new research suggests that many worlds across the galaxy could be habitable. Kane and co-author Dawn Gellino, also of the Exoplanet Science Institute, are now trying to determine which already-discovered exoplanetary systems might be good candidates for extremophile life. "There are lots of eccentric and gas giant planet discoveries," Kane said. "We may find some surprises out there as we start to determine exactly what we consider habitable." The study was published in the journal Astrobiology. The Habitable Zone Gallery can be found at www.hzgallery.org.